Looking back, I would consider myself an unusual kid. Mainly when it came to food. While I liked your typical mac n' cheese and apple juice, I was never really into soda, potatoes or bbq'd chicken. In fact, those things have remained on my dislike list even as a "grown up". Except the potatoes, which I experienced a defining moment with about three years ago. You see, mashed potatoes, baked potatoes, even french fries don't do much for me in the way of cravings. I had pretty much written them off as a useless, flavorless spud, only to be consumed in sparing amounts if absolutely neccessary. But as I said, about three years ago all that changed. I was home from college on my last summer break. It was late May and I was having dinner at my parents house with several family friends. We were, of course, enjoying this meal outside on a beautiful California evening. 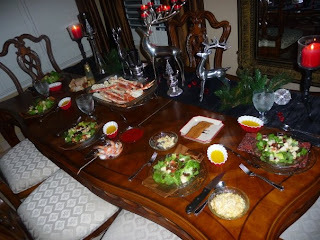 I specifically remember this dinner being one of sheer excellence, although my Mom is an excellent cook, she had really outdone herself. The meal consisted of an herb rubbed pork tenderloin, a gorgeous salad, grilled vegetables and roasted baby red potatoes. As a curtousy, I had scooped a very small amount of potatoes on my plate, but really had no intention of eating them. Don't ask what came over me because when I had finished everything else I took a bite. And that was it. I had never tasted a potato with so much flavor and texture in my life! I remember thinking, "I can't believe I have been missing out on this!". Ever since that night I actually crave this dish! The texture is unlike anything else with their cripy skin, soft inside and the subtle hint of herbs and sea salt! While browsing through my new Clean Eating cookbook I came aross this recipe and instantly decided it would be making an appearance on our menu this week. 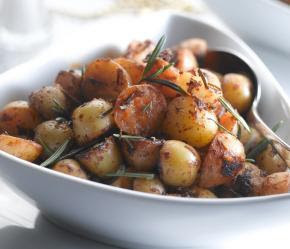 This of course is a guideline for these potatoes and can be used with any herbs you like. In my opinion, they are delicious with just potatoes, olive oil, sea salt and fresh rosemary, but feel free to play around with it. Although I must say, the addition of these sweet Italian onions is quite divine! The greatest thing about this recipe is that it looks quite impressive and rustic on your table, without being too fancy-pants. Just imagine how beautiful they would look beside a roasted chicken at your next dinner party! Preheat oven at 400 degrees. Line a baking sheet with parchment paper. Combine all ingredients in a large mixing bowl. Toss with clean bare hands. Place in an even layer on the baking sheet and place in oven. Bake for 40 minutes, or until crispy and brown. I opened my eyes this morning to the stark realization that it is once again Tuesday and I am no longer on break from work, normal life, etc. Total bummer, especially after such a lovely, long Christmas weekend! Although I have some comfort in this week being short due to the New Year! I really must get myself back into the groove! 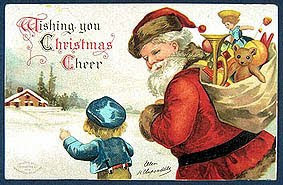 I hope you had a wonderful Christmas! Some of you even had snow (my Texan readers)! I know I really don't need to tell you that our holiday was amazing and lovely and everything good, but it truly was and I hope yours was too! This past weekend was filled with plenty of relaxation, and by that I mean cleaning, taking our tree and decorations down, learning to maneaver my new SEWING MACHINE and Chris learning the tricks of the trade on his new PS3! To say we had a good weekend would be a huge understatement! And on the subject of my new, fabulous and amazing Christmas present from my husband, I am in love with my sewing machine! And I have the sweetest family who made sure I was fully equipped with every possible sewing accessory I could ever need or want! I even received patterns, lovely fabric and the most incredible pair of fabric scissors you have ever seen (with cheetah handles!). Look out because my domestic adventures have only begun! 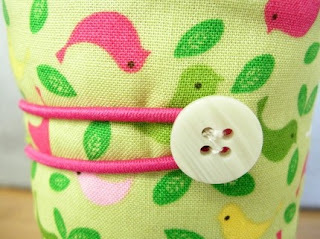 Project one: hemming our living room curtains tonight! But most of all, I loved spending time with our families, having friends and family over to our home and seeing my sweet friend Emily, who I haven't seen since her wedding in May! I am completely grateful for the people in our lives, overwhelmed by joy at all the Lord has done this past year and filled with excitement as I look to the new year with anticipation of what's to come! 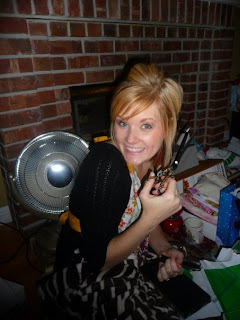 Super excited about my new cheetah fabric scissors!! All of the family about to have brunch! Cheers! I hope these last few days of 2009 treat you well! 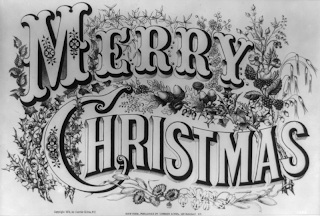 Since my long holiday weekend begins in just a few short hours and I will be blissfully occupied with friends and family the next several days and because you are probably equally as occupied, I'm going to wish you a Merry Christmas now! Hoping your holiday is absolutely wonderful! May you be filled with joy and overflowing with cheer! For the most part, I am a creature of new things, change and adventures, especially in the kitchen. But sometimes a girl just has no energy for creativity, say on the Sunday night before Christmas when she has a million little things to do. And when that happens it is quite important to have a quick and easy meal you can trust that is proven to please the husband and take minimal time. 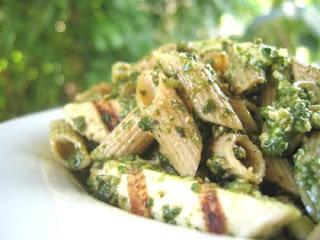 For me it is my Pesto Pasta with Sun Dried Tomatoes and Grilled Chicken. I know, simple enough, but it is probably one of the first "real" meals I started making by myself! In fact, I wouldn't be surprised if Chris thought this was the only thing I knew how to make in college (kidding...kind of...). Nevertheless, he's always happy when I serve this dish and truth be told, so am I, both for its taste and easy prep and clean up! Cook pasta according to package directions in boiling salted water. Meanwhile, season the chicken breasts with salt and pepper. Cook seasoned chicken on a grill pan until cooked through, about 4 minutes per side. When cooked, slice chicken into bite size strips. Once pasta is cooked, drain and return to pot. With a wooden spoon, stir in pesto until pasta is well coated. Toss in sun dried tomatoes and grilled chicken. Sprinkle with feta cheese if desired. Serve immediately. Mom and I managed to bake over 30 dozen cookies! You read that right..30! We made Chocolate Gingerbread cookies, Caramel Thumbprint cookies, Mexican Chocolate cookies, Butter cookies (w/ peppermint frosting! 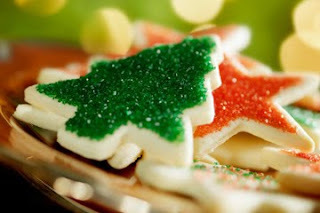 ), Macaroons, Apricot Almond Doodle Cookies, Peppermint Bark and White Chocolate and Peppermint covered Pretzel Sticks! Yu-mmy!! And today I brought each of my co-workers a cute Christmas box of assorted goodies and they LOVED them, which totally excites me! I got Abby and Chris' stockings done which means I am completely finished shopping! 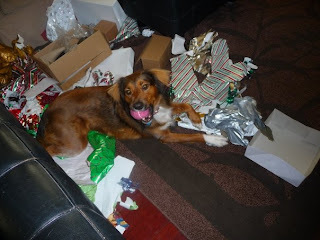 I gave my first Christmas present away! I love giving someone a gift you know they will love! We finally watched It's a Wonderful Life and I cried, like I always do when I watch that movie! And today I am gearing up for a great week! 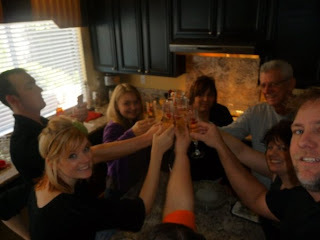 Starting tomorrow we are having friends/family over every day through Christmas! Ahh, that makes me so giddy! I adore cooking a good meal and playing hostess to wonderful people! Okay, so I know I said after our one year anniversary I would no longer celebrate "monthiversaries", and I haven't, until today, because I just can't resist! Today Chris and I have been married for 18 wonderful, blissful, inspiring and fantastic months! Do you realize this is the last weekend before Christmas?! Ahh! I am so stoked! This weekend will be full of tamale making with Chris' family, gift exchanges with sweet friends and enjoying the general splendor of the season with people we love! Of all the smells in the world, the one that tops my list is the gardenia! "The Gardenia is the most nostalgic flower, whose enthralling vintage perfume has the power to conjure up memories in an instant. 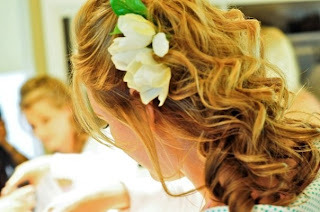 Gardenias are said to be the blossoms of love." 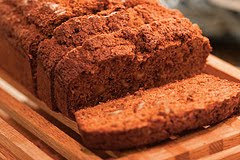 This morning, as I am delighting in a beautifully toasted piece of our very favorite banana bread, I realize I have never actually posted the recipe for the best banana bread I've ever tasted! Shame on me for holding out on you! I'll even admit that sometimes, I secretly buy a few extra bananas, hoping they will over-ripen so I have an excuse to make it! Prepare to enchant your taste buds! Preheat oven to 350°F. Spray an 8-inch x 4-inch metal loaf pan with cooking spray; set aside. Whisk together both flours, baking soda, flax meal, 2 teaspoons of the ground cinnamon and salt; set aside. Cream together butter with sugar using a mixer. Add eggs, one at a time, beating well after each addition. Mix in yogurt, bananas and vanilla. Fold in flour mixture and mix until just incorporated. Spoon batter into loaf pan. Stir together turbinado sugar and remaining 1 teaspoon cinnamon. Sprinkle over the top of the banana bread. Bake 55 to 60 minutes or until a knife inserted in the center of the loaf comes out clean. Allow to cool slightly, then remove from baking pan. Stockings are by far one of my favorite things to open on Christmas morning! You just never know what treasures you might pull out of that oversized sock. Just some ideas (and maybe a subtle hint for my hubby) to make this years stocking absolutely amazing! 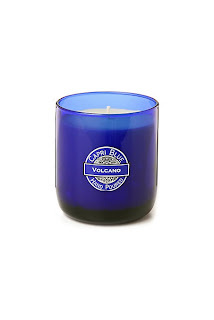 Capri Blue Volcano candle ~ One of my all-time favorite candles! They fill an entire room with their fabulous aroma! You can find them in several shapes and sized at Anthropologie. 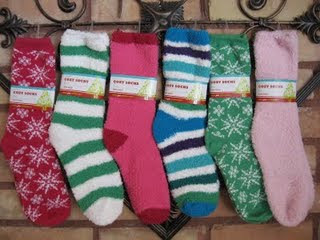 Old Navy Socks ~ Who doesn't love cozy socks! On the 19th these will be on sale for $1! At that price you could buy several pair! Lush Butterball ~ You can see my full post on some other fabulous Lush products here , but these delicious bath bombs would be a treat for any bath lover! 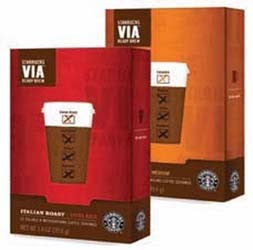 Starbucks Via ~ I've heard mixed reviews about Starbucks new instant coffee, but they seem worth trying to me! 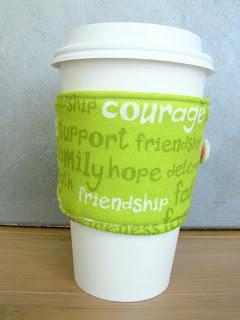 How wonderful would it be to have great coffee on hand in a pinch?! 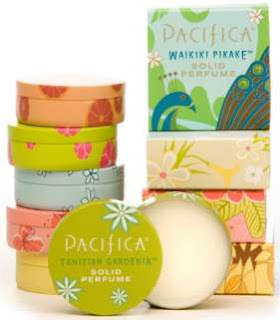 Pacifica Solid perfume ~ Delicious little solid perfumes that fit perfectly in your purse! And they come in the most delectable scents. You can find these at Whole foods for about $3.50. 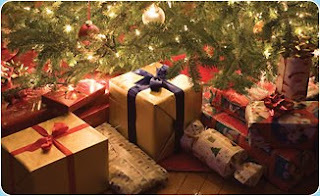 Only 9 shopping days left! Happy stuffing! 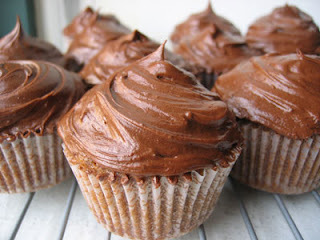 So apparently today is National Cupcake Day and I suddenly have the desire to go home a bake a lovely batch of these irrisistible little treats. Here's to the cupcake! I'm pretty sure I've mentioned before that I should have been born in a different era. I am SOO not a child of my generation! Mainly when it comes to technology. Let's see: I never have my phone and if I do it is on silent, I send about 25 texts a month, I would much rather call someone than email or better yet, meet face-to-face, I still keep a planner, I LOVE snail mail, and I love going Christmas shopping for just the right gifts! According to my husband, going out to find presents is so 10 years ago! I have always disagreed, protesting that it just doesn't feel the same and explaining my need to experience the hustle and bustle and the general splendor of it all...until this week, that is. As I posted yesterday, I only had a few stops to make and I would be completely finished shopping. So after work I went on my merry way in search of what I still needed to buy. Except only two of the five places I went had what I was looking for! It is impossibly frustrating to know what you want, have the money for it and NOT be able to take it home! 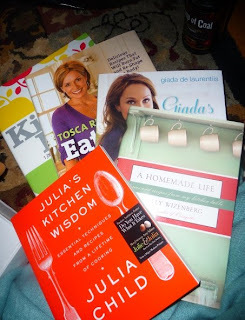 When I got home, not quite empty handed but close, I was discouraged and still had items on my list (grr!). And then Chris got home and while we were having dinner (Thai Lime Chicken, YUM! ), he suggested that I just look online for what I needed. And within 20 minutes my Amazon inbox was full of every single item I needed, and cheaper than any stores I looked in! And in a mere 3-4 days they will arrive at my doorstep and it will be like I went Christmas shopping minus the chaos of crazed shoppers! And an added bonus, there was no tax and the shipping was free! Today I am reveling in the sweet feeling of accomplishment. This weekend I was like a blizzard of cleaning, shopping and getting ready for Christmas (with a few parties thrown in there)! It was absolutely fantastic and I am happy to say that after a few stops after work today I will be COMPLETELY done with Christmas shopping! All in time to relax and take it all in. 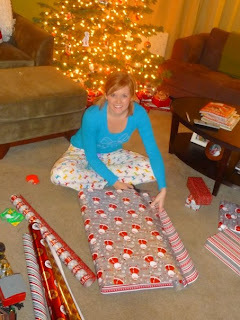 This also means I got to wrap presents last night while listening to Diana Krall's Christmas album (ahh, bliss)! I realized this morning that today officially marks the beginning of the one thing I love about working in the corporate world...lots of paid holiday time! And since I am quite sure this will be my last year working in this setting, I am going to fully enjoy my next 3 weeks! You've gotta love a 4 day week followed by two 2 1/2 day weeks! 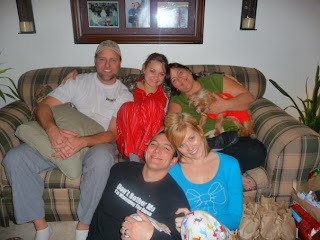 It just occured to me that Christmas is a mere two weeks away and this weekend is a great indicator of what the rest of the month looks like for the Hansen's. Tonight we are celebrating Chris' Dad's birthday with a Blues type concert. Tomorrow afternoon I have the annual tea party in memory of Chris' Granny with all the women of the family and Saturday evening we are celebrating our friend Laura's birthday with a fondue party (I LOVE fondue)!! On Sunday Chris will be at the Raiders game with his Dad (compliments of the tickets he won this week!) and I will attempt to get the rest of our Christmas shopping finished (I am currently about 70% done!). With the holidays quickly rushing by us, I am trying to be very intentional about savoring each moment and the wonderful people in our lives. I adore this time of year!! 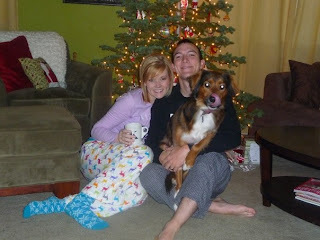 ps ~ We got our first Christmas cards in the mail this week! That's enough to get me excited about walking to the mailbox each day! 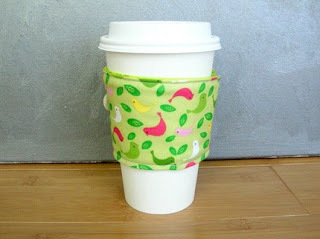 I am the proud new owner of this irresistibly cute coffee sleeve! Remember this post? As if I needed another excuse to drink more coffee! Happy Thursday! I hope your week has treated you well! While the topic of this post is obvious, I should give a small preface. I hate the word casserole. It seems to bring up nasty feelings in me and for some reason I cannot remember ever saying, "Mmm, dinner was great last night. We had casserole!". I mean really, they are typically filled with unhealthy, heavily processed things like cream of mushroom soup (barf! ), cheap meat and canned vegetables. Not to offend, but I have never been fond of any of those things. It just doesn't suit my personal taste. Which brings me to my fascination that I was even remotely inclined to make what I did for dinner last night. But it should come as no surprise that the recipe came from none other than Clean Eating! Now, let's get down to the good stuff, shall we! Heat a large skillet over medium heat and add a little olive oil. Add onion. Saute for about 8 minutes or until carmelized. Add squash and garlic. Add more olive oil if neccessary, and saute until cooked, about 5 more minutes. Remove vegetables from pan. Add more olive oil and cook chicken until browned on all sides, about 2 to 3 minutes. In a large bowl, combine vegetables, chicken and bread cubes. Mix in mozzerella, seasoning, salt and pepper. Pour mixture into an 8-cup casserole dish and bake for 15minutes, until cheese is melted and casserole is lightly browned on top. *This recipe serves 8 so I halved it since it was only the two of us. I also added some shredded cheese on top for a little extra cheesiness! Now I can actually say there is a casserole I enjoy and to boot, I don't feel guilty afterwards because I know everything in the meal is wholesome and delicious! And because calories taste so much better in dessert, I made chocolate chip cookies last night (from scratch, of course)! Delicious and the perfect treat while watching Julie and Julia! (Sigh) Isn't life grand! 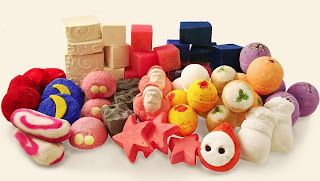 If you have already discovered the wonderful secrets of a little store called Lush, lucky you! But if you are like me, you've probable heard about it, walked past it and maybe even considered trying their products. Until now, that is! It all started with a little gift I received from my friend, Nicole. She's one of those sweet girls who always brings a little something for the hostess and basically always has thoughtful gifts. I LOVE her! Anyway, my first Lush product was received by her and then last week, my Mom gave me a few different products as well. Being a first rate girly girl, I was so excited to use my new bath goodies! Did I forget to mention it was an adorable Christmas themed snowman?! So cute, right? As if the bath bombs weren't amazing enough, I also used their massage bar. Hands down the best invention for at-home massages! It isn't sticky, oily, or messy at all! 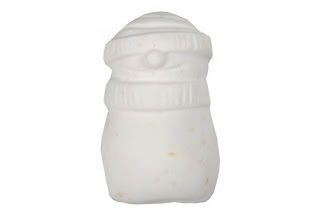 And this too leaves your skin ridiculously soft! 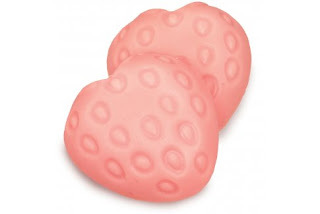 How sweet is this Strawberry Feels Forever massage bar?! 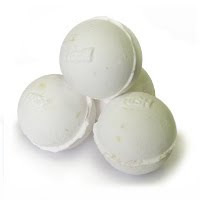 Next I can't wait to try the mimosa scented Christmas Party bath bomb! p.s. ~ these would make lovely stocking stuffers!! Totally. Completely. 100%. 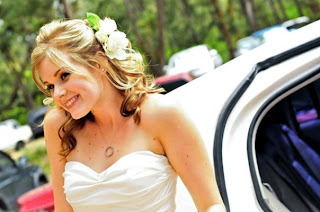 I could have written this song about my husband as he can always make me smile, and more importantly, laugh...A LOT! 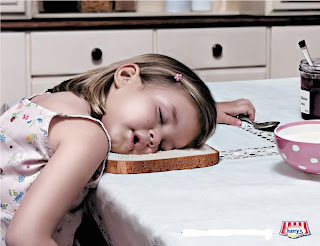 Ohh, you make me smile"
Since I can remember, I have always been a huge fan of breakfast food! Cereal, poached eggs, oatmeal, pancakes and of course, french toast! Imagine my dismay when I married a man who would prefer to sleep in than eat breakfast! Not to worry, I am determined to change that! Though I did manage to find something that even he couldn't resist. 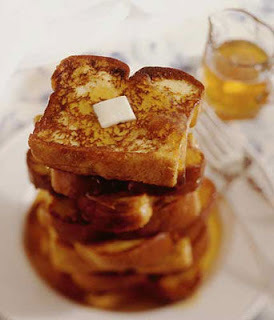 While browsing through Pinch my Salt last week I found this Spiked Egg Nog French Toast! For a little background, my husband is obsessed with egg nog and we just happened to have some in the fridge. So this weekend I whipped up this recipe and couldn't be more pleased with his raving reviews! It is super simple since you basically replace milk with the egg nog and in the interest of watching our waistline I used the "light" variety of nog. Also, I didn't have rum on hand so I substituted with 1/2 teaspoon vanilla as the recipe suggested. Try this for the egg nog lover in your house! Whisk together eggs, egg nog, rum and spices. Heat a griddle. Dip bread in egg mixture, allowing it to soak in slightly. Butter the hot griddle and place soaked bread on the griddle. Cook on each side until golden brown. Serve with butter and powdered sugar or syrup. Notes: The rum is optional. If you leave it out, try adding 1/2 t. vanilla in it’s place. To increase the recipe: for every three additional pieces of bread add one egg, 1/4 cup of egg nog, and 1 T. rum (or 1/2 t. vanilla). Being a West coast girl to the core and growing up owning one coat (for our trips to the the Midwest) I am not exactly keen on cold weather. Don't get me wrong, I adore Lake Tahoe in the winter, but if I'm being really honest, my ideal day in the snow is being bundled up in a cabin, by a roaring fire, sipping hot cocoa and indulging in a great book or playing games with the family. My extent of snow play lasts for about 7 minutes! My husband on the other hand, could stay outside in the flurries for hours on end building an awesome sled run and throwing snow balls. All this to preface my feeling about waking up this morning to find that it snowed last night! That's right, every uncovered car in our complex was wrapped in a light, snowy blanket and it was COLD! Needless to say, I bundled up extra tight and blasted the heater in my little car this morning! I hope your weekend was extraordinary! My weekend was definitely one of rejuvenation! Women of Faith was amazing and I am so glad I decided to go, despite being tired after a long week. It was exactly what I needed! 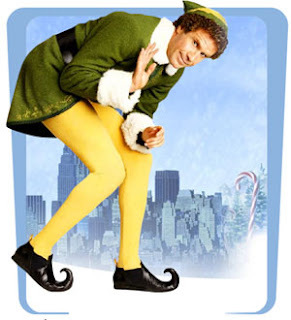 Saturday night we finally had Parris over to watch Elf (one of my favorite Christmas movies!). 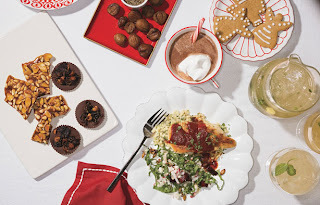 We sipped hot chocolate and enjoyed homemade peppermint brownies (thank you, Parris!) and it was fabulous, even if us girls did fall asleep during the movie (it was kind of late)! And Sunday was spent Christmas shopping with my Mom! 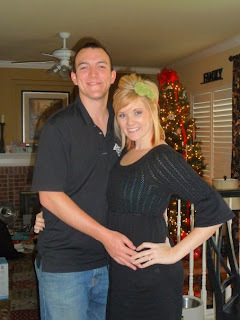 Hey, we had to make up for missing most of the black Friday madness with my Mom being sick! 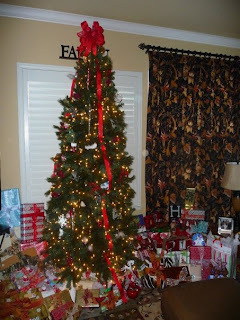 I am proud to say we made some good progress and we now have some presents under our tree! I feel so ready to take on this week! Have yourself a Merry little Monday! Words simply cannot express the relief I have for this week coming to an end. I'm happy to report that I finally feel like myself today after a week of being sick, exhausted, oh and way over-sleeping yesterday! But today I am officially in the Christmas spirit! Yesterday I took the initiative and put up our work Christmas tree and today our office is closing at noon for our company Christmas party at Il Forno Classico! Exactly what I need after a week such as this! I plan on savoring every last drop of this weekend with the Women of Faith conference with my Mom today and tomorrow, getting back on track with my running schedule (the bummer of being sick), making the husband some eggnog french toast (yum!) and hopefully making up for the fun I missed out on last weekend! Does anybody else feel like this? I adore holiday cheer as much as the next girl, I'm just having a hard time believing it's already here. So much to do and just a few short weeks to do it! I realized last night that Chris and I are truly two peas in a pod. As we were snuggled on the couch watching the cartoon version of How the Grinch Stole Christmas , I couldn't help but giggle at my husband for knowing almost word-for-word the theme song from the movie! He never fails to make me laugh! Now if I could only get him to love White Christmas that much we would be set! This weekend as I was laid up on the couch being a sickie, I was admiring our Christmas tree all decked with our childhood ornaments and I couldn't help but appreciate that I married a man with the same affinity for Christmas traditions as myself! You see, we both came into our marriage with a few boxes of ornaments. I'm not talking little boxes either! In fact, we had to sort through them this year and only ended up hanging about two-thirds of what we have! But it's so fun to share the memories they hold for each of us! This was our first "Hansen" ornament we bought last year! Folks, this is just a tiny drop in the bucket!